Our cold atomic gases research team, N. Šantić, D. Buhin, D. Kovačić, I. Krešić, D. Aumiler and T. Ban published their work in Scientific Reports where the cooling of the rubidium atoms has been studied by an unconventional method based on the use of femtosecond laser, which in the frequency domain acts as an optical frequency comb. This method could enable cooling of atoms with strong transitions in UV spectrum range which cannot be cooled by laser due to shortage of continuous-wave laser light sources in this spectral range. Our colleague Petar Popčević, in collaboration with scientists from the Physical Department of PMF in Zagreb, Technical University of Vienna, Austria, and the University of Minnesota has published a paper in prestigious journal Science Advances. 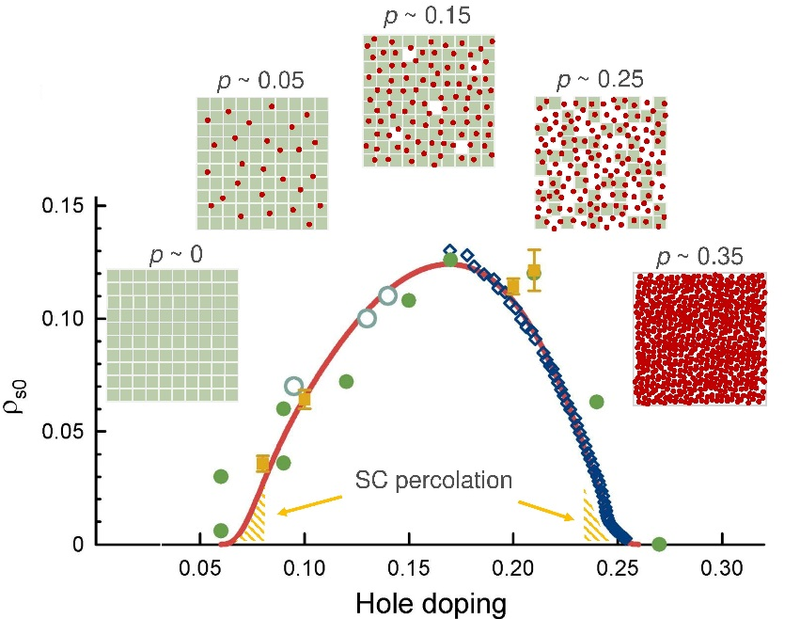 In this work a phenomenological model of high temperature superconductors based on copper oxides (cuprates) which describes and connects the most important features of these materials is proposed. Our colleagues Matija Čulo, Tomislav Ivek, Silvia Tomić, and Bojana Hamzić have together with collaborators from Zagreb, Japan, USA and Germany published an article about the influence of disorder on magnetotransport properties of organic insulators with Mott-Anderson localization. The article is published in Physical Review B and picked by editor as a highlighted paper. Our colleague Dino Novko and his collaborators from Spain and Germany have published a paper in prestigious journal Physical Review Letters. Combining many-body perturbation theory and an effective temperature model, they have disentangled the electron- and vibration-driven interaction channels in ultrafast CO motion on metal surfaces. Our colleague Ivan Balog and his collaborators from Université de Lyon in France have published a paper in prestigious journal Physical Review Letters. Their work demonstrates a new theoretical approach to describe the disorder-driven quantum phase transition in Weyl semimetals. As a result of the collaboration of Petar Popčević, a scientist from the Institute of physics, with scientists from Physics Department of the Faculty of Sciences in Zagreb, Technical University in Vienna and Minnesota University, a paper has been published in prestigious journal Quantum materials of the Nature group, in which the appearance of superconductivity in dc electric conductivity of cuprates has been explained by a simple model of superconducting percolation. Together with a group from University in Tokyo, Japan, our colleagues Petar Pervan, emeritus of the Institute Milorad Milun and alumni Ivo Pletikosić have published a paper in the prestigious journal Proceedings of the National Academy of Sciences about the acceleration effect of acceleration of hydrogen absorption by palladium through surface alloying with gold. Our colleague Ivor Krešić has published a paper together with collaborators from Great Britain and France on self-organization of magnetic dipoles in cold rubidium atoms illuminated by laser light using a feedback mirror. Our colleague Petar Pervan has together with groups from USA and Italy published a paper in Physical Review Letters on the electron band structure of tin selenide, a layered thermoelectric material. Together with our colleagues Valentin Jadriško, Borna Radatović, Davor Čapeta, and Marko Kralj, a group of researchers from Universität Münster, Germany, has recently published a paper on the transfer of strain at the grain boundaries of MoS2 monolayers grown by chemical vapor deposition. The results demonstrate that large-area artificially grown MoS2 monolayers are promising for mass-produced nanomechanical devices.